The much-loved original wine cork could be set for a return to the mass market with the launch of a twistable and resealable version that could do away with the corkscrew. The design is the result of a four-year collaboration between Portuguese cork manufacturer Amorim and US bottle maker O-I, who are aiming it at the £5 to £10 "popular premium" market. 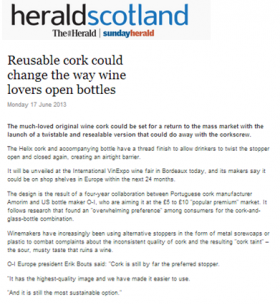 It follows research that found an "overwhelming preference" among consumers for the cork-and-glass-bottle combination. Winemakers have increasingly been using alternative stoppers in the form of metal screwcaps or plastic to combat complaints about the inconsistent quality of cork and the resulting "cork taint" – the sour, musty taste that ruins a wine. O-I Europe president Erik Bouts said: "Cork is still by far the preferred stopper. "It has the highest-quality image and we have made it easier to use. "And it is still the most sustainable option."